Merck (MerckGroup.com), a leading science and technology company, today announced that the largest delivery of praziquantel tablets ever shipped to Ethiopia recently arrived in Addis Ababa, the capital of the East African country. 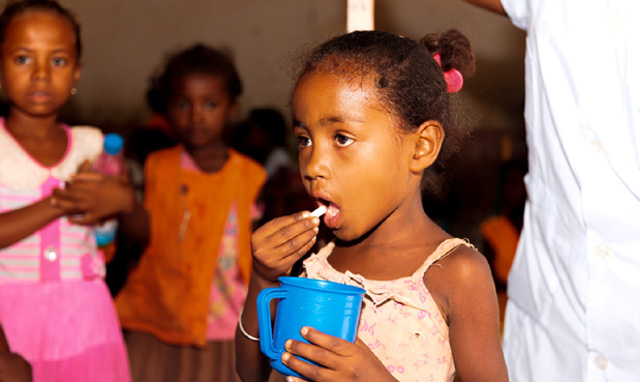 Ethiopia has received around 14 million tablets for mass distribution to school children. According to the World Health Organization (WHO), Ethiopia is one of the most endemic countries for schistosomiasis worldwide. It is estimated that around 23% of the overall population (23 million people) requires treatment. Ethiopia has been participating in the Merck Praziquantel Donation Program since 2012 and has received around 43 million tablets to date. We want to contribute to eliminating the insidious worm disease in order to help infected children to take part in the economic development of their home countries. “We want to contribute to eliminating the insidious worm disease in order to help infected children to take part in the economic development of their home countries. With our donation of approximately 14 million tablets to WHO for Ethiopia approximately six million school children can be treated – covering half of the country’s school-aged population in need of treatment. This shows that we are on the right track. However, we know that we alone cannot solve the problem with our tablets,” said Chokri Ahmadi, General Manager of Merck for Ethiopia, Sudan and the French-speaking countries in Sub-Saharan Africa. As part of its responsibility for society and within Health, one of its corporate responsibility strategic spheres of activity, Merck is supporting WHO in the fight against the worm disease schistosomiasis in Africa. Since 2007, more than 74 million school children, have been treated. To this end, Merck has donated over 340 million praziquantel tablets to WHO. Praziquantel is well tolerated and the most effective treatment to date for schistosomiasis. Merck is also supporting educational and awareness programs in Africa, developing schistosomiasis therapies for very young children and cooperating with partners in the Global Schistosomiasis Alliance.